Tonight I’m knocking back the last two styles contained in Mt. Carmel’s Porch Pack. Last week I had the India Pale Ale and Amber Ale to start off my review of the Porch pack. So far I’ve been impressed at how spot on to style Mt. Carmel is but not amazed or wowed in anyway. The IPA & Amber were both good beers, lets see if the Blonde & Nut Brown follow suit. This color is the definition of blonde and the clarity is astounding. I really believe that this is clearer than my tap water, definitely clearer than the tap water I had when I lived in Clifton Their is a perfect amount of white head that hangs around just long enough. Pretty tame aroma of bready malts with slight lemon/citrus hop. I had to get right up on it and give it quite a few whiffs to get what little I did. This isn’t a bad thing at all though, blonde ales aren’t supposed to be in your face smelly… at least not according to the BJCP. Flavor is strong on the malt side featuring sweet bread flavors that remind me of a warm roll. Kicks in a very very slight hop bitterness displaying a lemony zing. Very light bodied mouth feel with slight carbonation. Like Mt. 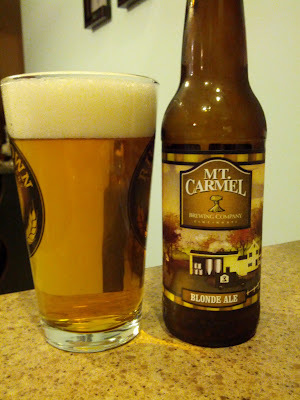 Carmel’s other year-round beers I’ve had (see the IPA & Amber reviews from last week) this beer is straight on to style. The smooth drinking nature of this beer makes it highly sessionable, and the fact that it’s 6% makes it even nicer. I don’t think my picture did this justice. It’s a amber shade of mahogany brown with a topping of toffee colored head. Definitely picking up on nuts in the aroma as well as lightly roasted malts that bring some sweetness to the nose. Another flavor to match the nose and the style. Roasted peanuts drizzled with caramel are the first thing on the tongue. Followed up with medium rare (like a steak, not a Pliny the Elder) bitterness and almost no hop presence. There is also a touch of maple syrup floating around in there somewhere as well. Ideal medium bodied mouth feel. Easily my favorite of Mt. Carmel’s Porch Pack and their standard lineup of year-round beers. Reflecting on the Porch Pack as a whole it’s not a lot of amazing beer. What it is is a 12 bottles perfectly representing 4 styles of damn good beer. This should be included in “Welcome to Cincinnati” kits and I recommend it to anyone who has good-beer-inclined in-laws visiting from out of town! I thought their Nut Brown was terrible. I thought it was overly bitter for a brown and I love bitter beers; extremely burnt tasting and bordering on astringency. There was also something of a metallic/copper penny aftertaste. I didn’t really get any nuttiness or even much malt flavor. Maybe the six pack I bought was old, but I was not impressed. I’ve heard of problems with the metallic taste before but didn’t get any in the bottle I had last night. My guess is that it’s either something they fixed or something that varies from batch to batch. I am a big fan of Mt Carmel but I have had issues twice with the metallic taste. Once with a nut brown six pack and once with a single stout bottle. If you tell them about it at the brewery they will replace it without question no matter where you bought it.